Coaster Photo – Ann Taborn, who owned and operated Taborn’s in Asbury Park with her husband, is pictured with her great-granddaugter Tara Fantini Cadet. “She reads the New York Times everyday without glasses,” said Tara Fantini Cadet, her great-granddaughter. Taborn does not even wear glasses for distance. All not bad for someone who will turn 100 Mon., Nov. 24. Many may recognize Taborn as the matriarch of Taborn’s restaurant, which was on Asbury Park’s Main Street, between Fourth and Fifth Avenues for about 50 years, closing in 1989. Before that, Taborn’s was at two other Asbury Park locations: Main Street near Mattison Avenue and on Bangs Avenue. Anna Foerst was born in Bayonne, the eldest of six. The family moved to Ocean Township in 1928, as the economy in Bayonne, according to Taborn, was worse than at the Shore. Her father built a house in Ocean Township, which was to be sold. No one was buying it, so the Bayonne house was sold and the family moved to Ocean Township. She graduated in 1932 from Asbury Park High School, the first graduating class in the new high school building. On Bangs Avenue, David Taborn Sr. opened up a luncheonette and had his menus printed across the street at Schuyler Press, where Ann worked. They met and married in 1935, having two sons, David Jr., 77, with whom Ann lives, and Robert, 76, who lives in Manchester. Around 1940, the business moved to between Fourth and Fifth Avenues, to 1206 Main St.
At 1206 Main Street, Taborn’s was originally a soda fountain, eventually expanding to a restaurant. It finally closed in September 1989. David Taborn Sr. died in 1998 at 86. Taborn has nine grandchildren, 15 great-grandchildren and one great-great-grandchild. The last is Carter Cadet, 7-months-old, whose mother is Tara Fantini Cadet. Taborn drove until about three or four years ago — “I don’t think she had a ticket or accident,” said her sister, Ruth — and lost her first tooth just last year. Maybe Taborn’s longevity is in her genes. 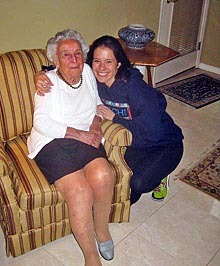 Her mother lived to 95 and her sister, Ruth, is 92. Or maybe it is the daily pop she has. “I have white wine every night with my meal,” Taborn said. On Friday, Nov. 28, Taborn will celebrate that birthday with family and friends at the Deal Country Club.